More snow. More birds at the feeders. 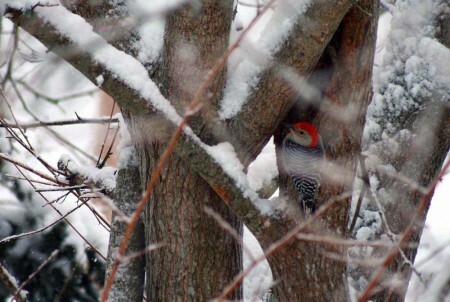 This one is a flicker red-bellied woodpecker. Thanks to my sister-in-law, Mary, for correcting my bird identification. The fact that it’s a red-bellied woodpecker is way better because we see them rarely in our area. So I confused it with a flicker, not flickr. Doh! Take some photos this weekend! Oh, my gosh, what a great photo! Beautiful!! Have a great weekend. What a pretty bird :). Have a nice weekend! Do you take your photos as you walk down that path, the one we took, behind your house? I can see you there with your camera. Nice shot! I love seeing the birds in the snow – it gives me the hope of the spring that is soon to come. I am so bad with remembering the camera. And you would think I would be better since I just got a new one. I WILL take pictures this weekend – hopefully of my finished knitted items! And maybe some nature shots too. He’s so cute. My pileated woodpecker has been drumming and staking his territory in my wetland. I love Flickers! Great shot! I’ve never seen a flicker in Rockport, but I haven’t looked, either. Just reread your 100 Things About Me for fun. One Thing About Me – I also didn’t vote for Bush (either of them.) I very much enjoyed reading about all the many points from Obama’s Inauguration speech which Karl Rove found insulting, the speech the Bushies watched on the plane back to Texas. Another beautiful shot! And a beautiful bird! Dayum, you’re good with that camera! Have a super weekend and keep the pictures coming! We had 30 wrens come to breakfast on the back porch yesterday! It looked very Alfred Hitchcock out there. I have to put out more birdseed. I love that picture. I wonder if we put out some bird feed if birds would come during the winter. oh how very funny. because before I saw your text for this post, the photo popped up, and I said (outloud) what a fabulous photo of that flicker! I love your bird photos! Beautiful photo. Be glad it’s not a flicker — they are very fond of making a hole in the side of a house and setting up housekeeping in the exterior wall space. Woodpeckers aren’t nearly as brazen and generally stick to aerating trees. That photo has just brightened my day! So pretty! I love seeing red on the birds in winter; it definitely brightens up the landscape. Have a great weekend! I really enjoyed the photo! I need to get my bird feeder fllled. I miss the colors of east cost birds. Our woodpeckers have beautiful orange underfeathers that you only see in flight or on the ground, apart from the bird. definitely eye candy! the color, the concept. we have lots of migrators here, but no snow to show them off. guess they like it better in terms of seed hunting, tho. It’s a lovely shot! You can see I’m WAY behind in blog reading here… We had one of those here last winter. I was very amused that the red BELLIED woodpecker is recognized by its red HEAD. And that the book said they had localized winter irruptions (yeah, that’s with an i not an e).